The 5-10 minutes of disease discussion that typically occurs between newly diagnosed patients and their physician represents a valuable marketing opportunity. It's the point at which a patient begins to learn about their condition and becomes acutely aware of how it will impact them moving forward. 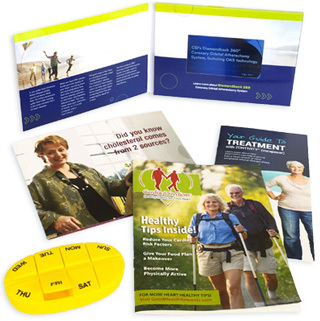 Brand-supported patient education materials in print and/or physical form represent the most patient-friendly format for exam room and take-home use, with portability that extends your message beyond the office visit. Contact us for an introductory review of Dialogue Company custom services to integrate your brand into point-of-care discussions between your target physicians and relevant patients.